We learned somehow along the way that we are buried with Christ in his death and we rise with Him through the waters of His baptism. The life of the parish priest is a constant peeling away at what it means to bring the oils of baptism, healing and unction into the hospital room and the sick bed. The anointing of Jesus feet before his crucifixion by his old friend Mary evokes these experiences from a long priesthood. Rosemary and I would run up the stairs from Sunday school to the parish hall. We’d slow down enough to reverently (almost) enter the church for the end of the Service. The stained glass window of a black Madonna and another of the Ascension intrigued. Twenty years passed and Rosemary and her husband had a baby boy and came to me to baptize him. 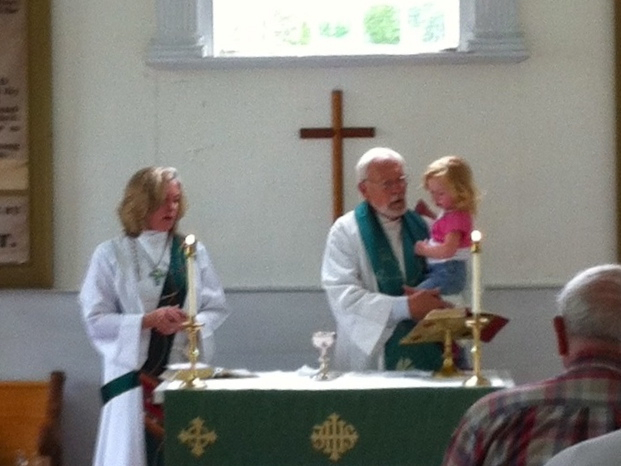 The baptism was delayed due to minor surgery for Rosemary and a slight stroke for her mother. Rosemary left her son with her mother who, it seemed, had recovered enough to watch the child. The boy was using a walker now, one of those round trays on wheels that let the boy scurry around the kitchen like a “ball o’ fire”. That day the harness that held the boy slipped and his neck was caught on the tray and he suffocated. Rosemary and her husband called me. The child was in the Emergency Room. Please come. They wanted me to baptize the baby. I grabbed oils and a prayer book and rushed to the hospital. The male nurse brought a wash basin with water. I blessed the water and immersed the child. “Robert I baptize you in the name of the Father and the Son and the Holy Spirit.” I took the body in my arms and poured the blessed oil on his forehead. I made the sign of the cross and said: “Robert, I anoint you with this holy oil. You are marked as a child of God and Christ’s own forever.” He was also anointed with our tears. The gay man said, “You don’t know me.,You’ve never asked anything about me.” Surprised, I recognized the truth of what he was saying. I said.” Well, let’s get together next week for lunch. I’ll come to where you work.” He had been active in many activities around the cathedral. We spent hour’s together working in the garden. Except for a short greeting, we had not spoken. Not once. I was embarrassed. “She bought the ointment for my burial.” Such great loves break our hearts and crack us open. My dear friend was dying. He’d been moved to the hospice floor of the hospital, hovered over by nursing and medical staff who loved him as much as we did. Gene Logan was one of the great-souled ones. a contemporary Mahatma. He loved life and the life was, now rapidly, draining away. Jean, my wife, and I had to go away for a day and we were afraid he might not make it before we returned. Early in the morning we went to see him. Jean lifted the covers off his feet and began the rub them. A smile spread across his groggy and drugged face. Awake now I continued to joke with him. I was not going to stop joshing back and forth just because he was dying. What better time for a chuckle. “Gene,” I contended, “You say you’re Irish, but your mother was German, How’s that?” ”Well”, he replied affecting an Irish brogue, “Me sainted mother said that because I was born on St. Patty’s Day, I was doubly Irish.” He was a great story teller, stories that came out the streets of Brooklyn in a family of eight, years in the Navy, and raising a family. Jean and I gathered at his side; we held his hand, gave him communion and anointed him. Before we left Jean opened a chocolate candy bar and gave him a piece. Another smile enveloped his face. It looked as if he was tasting chocolate for the first and last time. Then we left, Jean making sure he had the rest of the bar to eat after our departure. When Sally, Gene’s wife, arrived an hour later, Gene was now peacefully asleep. Tell tale brown covered his lips, hands and face. She was afraid something terrible had happened to him in the night. She soon discovered that we were the culprits. He lasted another forty-eight hours. We were there with him and his family as the breath left him. Happy St Patty’s Day, Gene. and Happy Birthday. I’ve baptized hundreds of babies and adults. Almost all of them were celebrations at the beginning of life. The oil for anointing was chrism or anointing for baptism. We learned somehow along the way that we are buried with Christ in his death and we rise with Him through the waters of His baptism. The life of the parish priest is a constant peeling away at what it means to bring the oils of baptism, healing and unction into the hospital room and the sick bed. The anointing of Jesus feet before his crucifixion by his old friend Mary evokes these experiences from a long priesthood. Rosemary and her husband called me. The child was in the Emergency Room. Please come. They wanted me to baptize the baby. I grabbed oils and a prayer book and rushed to the hospital. The male nurse brought a wash basin with water. I blessed the water and immersed the child. “Robert I baptize you in the name of the Father and the Son and the Holy Spirit.” I took the body in my arms and poured the blessed oil on his forehead. I made the sign of the cross and said: “Robert, I anoint you with this holy oil. You are marked as a child of God and Christ’s own forever.” He was washed by the flood of our tears. The gay man said, “You don’t know me, you’ve never asked anything about me.” Surprised, I recognized the truth of what he was saying. I said.” Well, let’s get together next week for lunch. I’ll come to where you work.” He had been active in many activities around the cathedral. We spent days together working in the garden. Except for a short greeting, we had not spoken. Not once. I was embarrassed. I thought of Mary anointing Jesus feet on that night long ago. “She bought the ointment for my burial.” Such great loves break us and break us open. Old timer Don MacKinnon was straight from a quadripple heart bypass operation. He showed the young priest the staples that held the incision that covered most of his chest cavity. He was glad he could stand. That week an earthquake struck Naples in Italy. Nearly 3,000 perished and an elementary school had been leveled. For days frantic rescue workers unsuccessfully tried to reach the children trapped below. “Where was God?” Don asked the priest. The priest tended to avoid easy answers. The sense of abandonment, the absence, the dull –dead space when blood rushes from the head and all is cold isolation was familiar territory. It was too easy to fill the vacuum with specious answers. For now, the priest knew, there is only pain and questions. Do you know the Twenty –third psalm?” The priest asked. “Of course,” Don said. Most all the old timers had that psalm memorized since childhood. “Say it with me”, asked the priest. He leadeth me beside the still waters, He restoreth my soul. After a lengthy silence the priest asked, “What strikes you Don?” “…Though I walk through the valley of the shadow of death, I shall fear no evil, for thou art with me.” Don replied. “Has there ever been a time like that for you?” the priest asked. “During the surgery,” Don replied. The young priest might have said to Don: “Where is god? God is in the rubble. God cradles the little ones in arms of love. She takes them in her loving embrace and weeps with ones who are left behind. God in God’s vulnerability takes on the whole world of suffering, and refuses to turn away from its numbing pain and stay with us through the “valley of the shadow of death”. Why would God take away our suffering any more than God would take away her own? God’s presence with those who suffer, while not always felt, is an article of faith to me.” But that was long ago. He doesn’t remember everything he said to Don that day. Now that March is here in the North Country, I’m going to spread lots of manure around the roots of my fruit trees. Figs don’t grow outside here. I‘ll have to wait for Florida or Jerusalem. I imagine we all have stories of our own prodigality, the waste of our resources, energy, thought, over giving, Let us count the ways. It may not be a good Idea for the parish to hear of all your prodigal days. Even so, my years in college and in Seminary were the result of my fathers VA benefit after WWII. He had been killed in action and so the benefit for education that would have gone to his going to Middlebury College, came to me. I spent those college days in less study and more prodigality. Certainly I had to work two or three jobs to supplement college and seminary tuition and fees and I was often too bushed to study. But I “could” have been a lot more disciplined. I probably owed that to my father. And yet, I wonder if there is a part of us that needs to break away from the assigned roles of family, culture, and nation. Isn’t there a part that needs to get away from the farm, suburb or the neighborhood to see the world? Maybe that is why the father is so prodigal with his generosity. The son who is lost and is found has learned a hard lesson about life. He has also learned humility and gratitude. Not that the father in his prodigal generosity needs a reason, he may see the necessity of getting out from under the heavy burden of duty and hyper-critical responsibility. The elder son may never get it. Hide and duty bound, he is like that part of us that has always shown up. He’s always been on the job, never took a break. Often there is no greater resentment than that of those who have given much. Loyal and stuck, the father reminds him so painfully and elegantly,” My boy, you have been with me all these years, there is nothing I have that is not also yours” The father presents an opportunity for the elder son to turn and receive his brother, to turn toward the light and the gaiety and the dance—or to turn away from his brother and the love of his father and walk into the darkness. Some would probably say the father is over generous. And isn’t that just like God. Always ready to give away the shirt off her back: such prodigality. What will we ever do with her? The Temptations of the Christ and the Buddha, 1st Lent. Luke 4:1-13. The Temptation to Give Up. I’d frequently retreat for a day into the mountains. There the tempter would sometimes come with me. The typical approach of the tempter was to list my various failings. The list was sometimes extensive and at least partly, true. However, the major one was the attack on my sense of call: To be of some use to the holy and the world. The temptation was to give up because one could not, with ones limitations, be of any earthly use. I’d frequently encounter visitors who’d comfort me. Once a butterfly alit on my salty knee and stayed there while I remained still and watched, or a chipmunk begged a peanut. There were long vistas from mountain tops and the tiny alpine flowers that in spring covered the ground; the melodies of songbirds and the flight of red hawks that soared in up drafts of air and the music of the mountain stream that sang, and I stopped and sang with her. All these visitations and many more were as reassuring as the ministry of angels was to Jesus at the end of his temptations. At root all temptation is to get us to reject our call to be God’s beloved child. Or to be who we truly are meant to be. A number of you have said you’d like to hear about my recent travels and insights about India. It may interest you that Jesus and the Buddha were similarly tempted to turn from their divine call. Their temptations; those of Jesus who would become the Christ and those of Siddhartha who would become the Buddha were strikingly similar. Each had a tempter or demon. Satan for Jesus, Mara for the Buddha. Both were tempted by appetites, the hunger and desires of the flesh. Jesus who was hungry after his fast was tempted by bread. Siddhartha was tempted by the three beautiful daughters of Mara. For Jesus the temptation of the loaves of bread was more than a sign that he would have to control his appetites if he was to fulfill his call and mission. It was a temptation to feed the hungering world. Later he would feed the five thousand and the four thousand. However, at that time, he freely chose to feed those numbers of people because of their need and hunger and not because of the voice of the tempter. The second of the temptations were, for Jesus, the pinnacle of the temple where Satan challenged him to prove he was the Son of God. It was also the temptation to harm himself, even to commit physical and spiritual suicide. For Siddhartha, Mara sent an army that threw spears and arrows at the master as he practiced meditation. The weapons turned into Lotus flowers before they struck the young man. One has to be able to control one’s fears, including fear of failure, inadequacy, or conversely pride and hubris. Both overcame their fear by knowing the truth-that the real self cannot be harmed. Jesus realized that the desire to prove the truth is a temptation itself. Both refused to give life to the apparent evil and by doing so denied its existence. Jesus would face into his real fears as he rises up to go to Jerusalem where he understands his life is in danger. And yet he goes. Jesus, not denying his fears, refuses to let his fear control him. The Final temptation of Jesus and Siddhartha is to become earthly rulers of the kingdoms of the world. It is the urge to make the world conform to our ideas of how it should be. Who better to rule the kingdoms of the world than a spiritual master and the son of God? Both turn their tempters away. Probably the ultimate temptation is to keep these spiritual strivings to oneself. Both Jesus and Siddhartha realize that what they experienced has to be shared and taught and modeled. Jesus very next act is to leave the mountain of temptation and call Peter, James and John. Buddha also draws a circle of five disciples around him. The truth of the inner life is that one is not only an individual being, one is also connected to all living things. That at the heart of the world for Christians is a God of Compassion who calls each of us to be a beloved child. Old timer Don MacKinnon was straight from a quad-ripple heart bypass operation. He showed the young priest the staples that held the incision that covered most of his chest cavity. He was glad he could stand. That week an earthquake struck Assisi in Italy. An elementary school had been leveled and for days frantic rescue workers unsuccessfully tried to reach the kindergarteners trapped below. “Where was God?” Don asked the priest. “Do you know the Twenty –third psalm?” The priest asked. “Of course,” Don said. Most all the old timers had that psalm memorized since childhood. “Say it with me”, asked the priest. Yea, though I walk through the valley of the shadow of death, I shall fear no evil. For thou art with me. The rod and thy staff, they comfort me. Thou preparest a table before me in the presence of my enemies. My cup runneth over. That whole generation of the Jews since Job had refused to “blame the victim” for tragedies that were caused by nature, poor construction and the cruelty of tyrants. Suffering is not because you did something wrong, Jesus is saying. And yet here is the opportunity to reflect and “turn around”. That whole sense that time is running out which it was and always is… we don’t have that much more time to fool around with our lives. It’s time to take stock., Rather than mark time, to use the life we have left to bless the creation. Sure we suffer and suffer greatly because we sin, We sin against ourselves, each other, the creation. We sin institutionally, and personally. Sin is broken relationship, says Tillich. All but the socio-path and psychopath have an inkling of what sin is. But that is not the point of Jesus reference to the collapse of towers or the vindictiveness of Roman tyrants. , . Now that March is here in the North Country, I’m going to spread lots of manure around the roots of my fruit trees. Figs don’t grow outside here. Lent II: What’s the worst they can do to you? Victoria “Vicki” Soto, one of the teachers killed in Newtown, CT came from Stratford, CT., where I served as the priest of CT’s oldest Episcopal parish. Vicki attended High School there, and after her education at Eastern Connecticut State, started to teach in Newtown at the Sandy Hook Elementary School. She had taught there for five years. The Soto’s had been sometime members of the parish, connected by the marriage of Juan Soto and Amy ten years ago and the resulting baptisms of their two babes. Vicki’s father was a soccer coach to the children of a number of families in the parish. Vicki loved teaching her first grade class in Sandy Hook. “ That ‘Friday morning she went to the school library to find what she described as the ‘perfect” book for her first graders that day’, Soto’s colleague Yvonne Cech, the library media specialist, said the next day” *. When the mad young killer rampaged through the school at Sandy Hook, Victoria gathered the children and hid them in closets and cabinets behind her to protect them. She and co- teacher Ann Marie Murphy (52) were gathering the children when they came face to face with the killer. Both Victoria and Ann Marie shielded the students from the young man, saving ten of the fifteen of her beloved charges. Ann Marie was found with her favorite student cradled protectively in her arms. They like hens gathered their brood under their wings. Most they were able to save. A week ago the Stratford School Committee named a new school after Victoria Soto. “She will always be remembered said her sister.” Victoria was 27 years old. The old organizer asked, “What’s the worst they can do to you? Kill you?” There are a lot worse things than death: Like watching children die and doing nothing; feeling powerless as a loved one suffers, being a coward in the face of abuse; and continually looking the other way at injustice. .
Clearly Victoria, Ann Marie the Principal of the school and the three other adults who died that day had hearts of love great enough to place themselves between the killer and the children. Maybe the only thing that can move us out of fear is a love so deep that it is stronger than fear. On that day Jesus confronted the killers and bullies of his own day. Out of love for us he gave his life up so that we might have life and have it abundantly. What is the one thing that would move you from fear to a love so fierce that you would stand up to a Herod or a bully? What after all is the worst they can do to you? Kill you? I think, maybe not. Maybe the worst is to live in a fear or laziness that keeps me from confronting those who do harm to the little ones, the vulnerable, the creation, and the animals with tails and mouths and noses and eyes and ears and who can do all kinds of wonderful things. I suspect there will grow from this tragedy a generation of teachers who, like Victoria and the others, will live through their grief and fear and continue to be the hens who gather their broods under their wings and protect them with their fierce love. This I believe. We have been witnesses to the love of one of God’s great ones. Victoria “Vicki” Soto of Stratford, Connecticut.